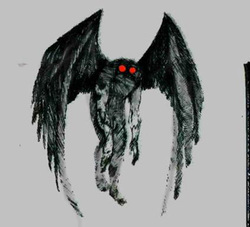 A fictional, moth-like creature first recorded in 1966 in West Virginia. Tales of similar urban legends have grown since. 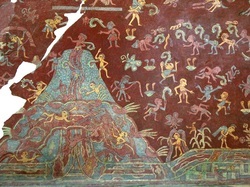 Mexican Indians claimed to see a "flame of butterflies" as imagery in folklore, and it is believed that what they witnessed was a monarch migration consisting of millions of butterflies. 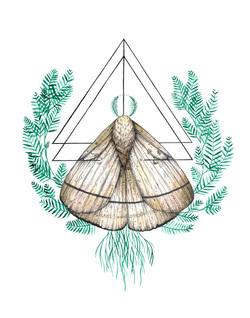 In modern culture and art, the moth is often visualized as a creature of peace and serenity. It is also associated with the green movement and environmental conservation. Ancient Mexicans built a palace just outside of Mexico City dedicated entirely to butterflies. The city in which it is located is now the oldest metropolis in Meso-America. This idea has gained popularity in recent years, and has even been made into film, book, and video game interpretations. It is the notion that one small action can have unknown or major catastrophic consequences beyond any visible correlation. It is connected with the concept of the flap of a butterfly's wings causing a natural disaster on another continent. In countless ancient cultures, butterflies and moths are considered omens. Many of these omens are contradictory- omen of death, birth, marriage, rain, summer, sun, good health, or sickness. 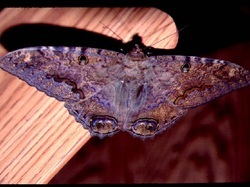 This moth is considered a harbinger of death in both Mexican and Caribbean mythology. Its sighting is often associated with misfortune and drastic accidents. It is so large and dark that it has been mistaken for a bat by many people.